My last couple of Doctor Who leaks were fairly solid — Neil Gaiman to write 2010 “Doctor Who” and Tom Baker returning to the series proper in an unnamed role. Both have been bubbling under ever since. The next one is not so tied down. It’s still rather up in the air. But it’s quite a possibility. The sixth series of “Doctor Who” (2011) will star Paterson Joseph as The Doctor. …and more importantly Benjamin in “Jekyll.” Written and produced by upcoming “Doctor” Who showrunner, Steven Moffat. If true, it’s a great call on Moffat’s part. A damn fine call. Paterson has a very British Authority approach to many of his characters, comparable with Jon Pertwee. It’s not a traditional choice, but then neither was Christopher Eccleston. And, like I say, it’s bloody brilliant. Abrams says he was also drawn to the project because he believed in — and wanted to evangelize — Trek‘s unabashed idealism. ”I think a movie that shows people of various races working together and surviving hundreds of years from now is not a bad message to put out right now,” says Abrams, whose infectiously upbeat energy and disdain for cynicism are among his most marked attributes. Life on Mars hasn’t been doing too well in the ratings but has been receiving excellent reviews. The second episode, like the first, was based pretty closely on the BBC episode, with the show reportedly going to begin diverging more. The potential science fiction aspects of the show are maintained by having Sam consider the various possibilities as to how he is now living in the past. His theories include the eventual explanation in the BBC version, which I won’t mention to avoid spoiling the series. For those who are aware of the explanation on the original, there have been reports that the American version might wind up with a different explanation. This week’s episode also also included brief connections between past and present, from messages in the clouds to a small robotic character. 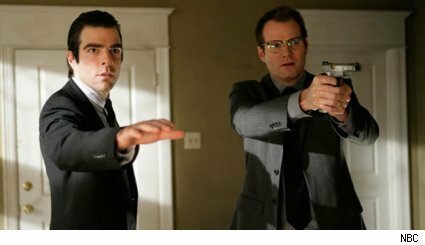 Blumenfeld) was responsible for both this appearance of Linderman and Nathan Petrelli’s visions of Linderman. This was orchestrated by Arthur Petrelli (Robert Forster) who is on the opposite side of the battle from Mama Patrelli. The second half of the season will be entitled Fugitives and will add a new member to the cast–Zeljko Ivanek, who won an Emmy for Damages. He will appear as a character named the Hunter who presumably wind up hunting the other heroes, making them fugitives. On Fringe, Olivia Dunham has visions of John Scott (Mark Valley). While his appearances turned out to solely be in her mind (perhaps similar to Six in Baltar’s mind on Battlestar Galactica.) While only being in her mind, his messages had too much bearing on current concerns to be written off as mere hallucinations. Walter provides a possible explanation that a previous experiment connecting her to Scott’s mind may have imprinted her with his consciousness, experiences, and thoughts. Is a few brief news items, nine more episodes of Terminator: The Sarah Connor Chronicles have been ordered to complete the season this year. Mad Men has been renewed for a third season. The concluding ten episodes of Battle Star Galactica will begin airing on January 16. Posted in Barack Obama, Sarah Palin, Science Fiction, Television. 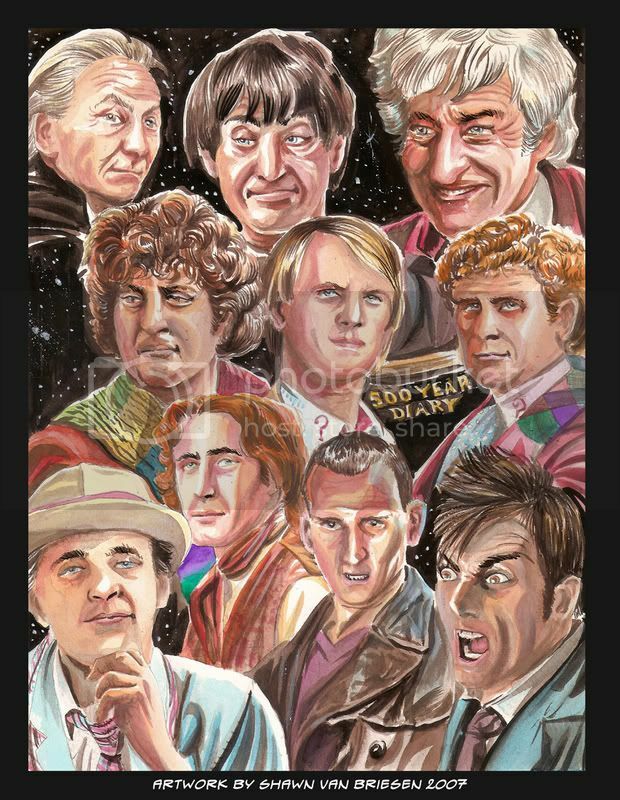 Tags: Barack Obama, Battlestar Galactica, David Tennant, Doctor Who, Heroes, John Cho, Jon Pertwee, Life on Mars, Mad Men, Neil Gaiman, Peter Davison, Sarah Connor Chronicles, Sarah Palin, Science Fiction, Star Trek, Star Wars, Terminator, Tom Baker. RSS feed for comments on this post.. TrackBack URL.